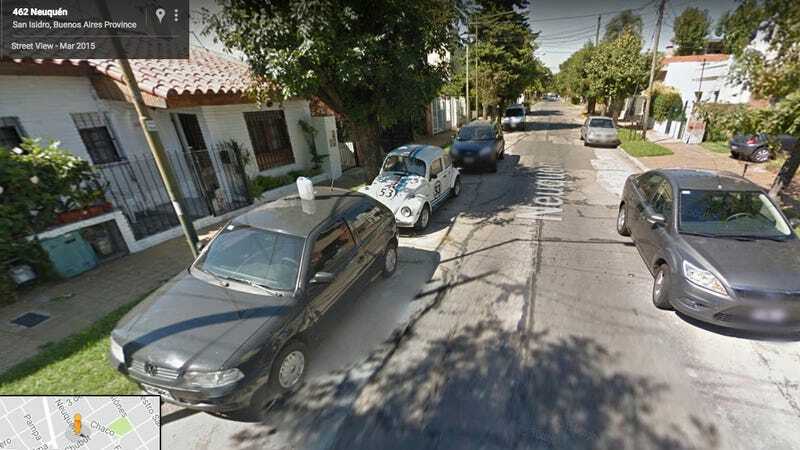 Herbie, the sentient 1963 Volkswagen Beetle that starred in several Disney movies, is apparently enjoying a modest retirement near Buenos Aires, Argentina. Jalopnik reader John B. spotted ol’ Herb on Google Street View, presumably while looking for directions, and shared his find with us. You may have known that Herbie went to Monte Carlo, and eventually even went bananas, but I didn’t realize he traveled as far south as the eastern coast of Argentina. I guess he’s probably trying to get out of the limelight after getting mixed up with Lindsay Lohan, so I felt a little bad about putting him on blast here but then I remembered he’s a fictional car and probably won’t hold it against me. If you’re in the area and see Herbie posted up on Calle Neuquén tell him we said “hi.” If it reacts in a sentient manner, back away slowly.